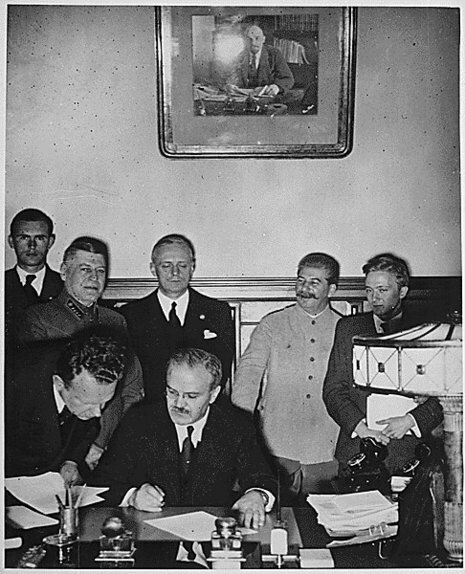 The Molotov–Ribbentrop Pact, colloquially named after the Soviet foreign minister Vyacheslav Molotov and the German foreign minister Joachim von Ribbentrop, was an agreement officially titled the Treaty of Non-Aggression between the Third German Reich and the Union of Soviet Socialist Republics and signed in Moscow in the early hours of 24 August 1939 (but dated 23 August). It was a Non-Aggression Pact between the two countries and pledged neutrality by either party if the other were attacked by a third party. Each signatory promised not to join any grouping of powers that was "directly or indirectly aimed at the other party." It remained in effect until 22 June 1941 when Germany implemented Operation Barbarossa, invading the Soviet Union. In addition to stipulations of non-aggression, the treaty included a secret protocol dividing Northern and Eastern Europe into German and Soviet spheres of influence, anticipating potential "territorial and political rearrangements" of these countries. Thereafter, Germany and the Soviet Union invaded their respective sides of Poland, dividing the country between them. 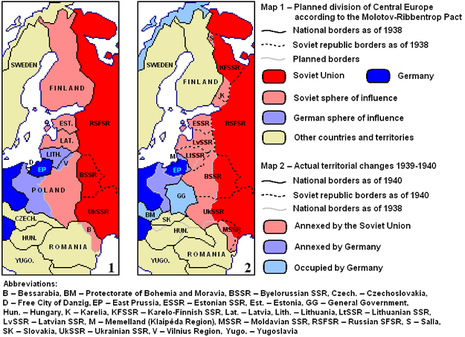 Part of eastern Finland was annexed by the Soviet Union after an attempted invasion. This was followed by Soviet annexations of Estonia, Latvia, Lithuania and eastern and northern Romania. The protocol is considered a crime against peace as a conspiracy to conduct war of aggression. On August 23, 1939 Hitler and Stalin signed a non-agression pact, called the Molotov-Ribbentrop Treaty. 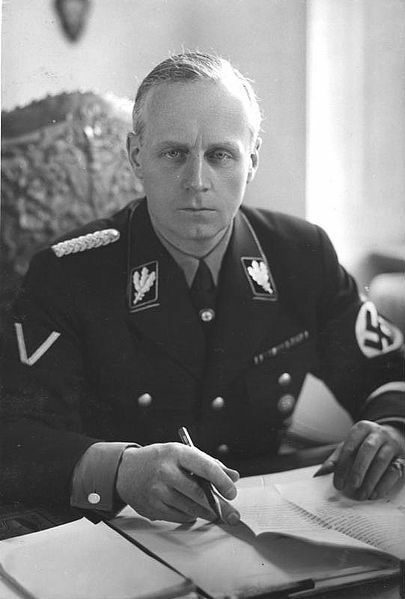 Secret protocols of the treaty defined the territorial spheres of influence Germany and Russia would have after a successful invasion of Poland. Hitler had been creating justifications and laying plans for such an invasion since April. According to the agreement, Russia would have control over Latvia, Estonia, and Finland, while Germany would gain control over Lithuania and Danzig. Poland would be partitioned into three major areas. The Warthland area, bordering Germany would be annexed outright to the German Reich, and all non-German inhabitants expelled to the east. Over 77,000 square miles of eastern Polish lands, with a population of over thirteen million would become Russian territory. The central area would become a German protectorate, named the General Gouvernement, governed by a German civil authority. n the evening of 21 Aug 1939, Berlin radio interrupted a musical program to announce the upcoming nonaggression agreement. 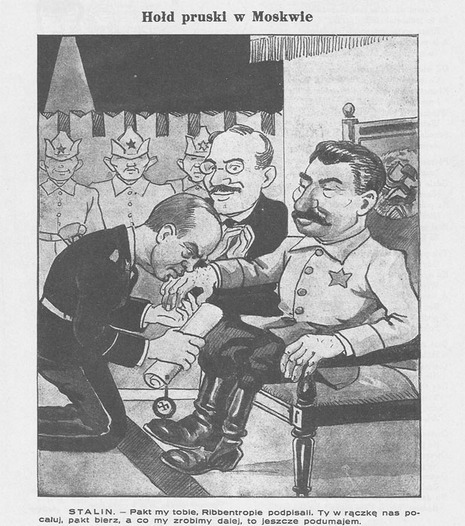 In Moscow, Ribbentrop was able to convince that the western Allies were dragging Russia into war. He also promised Russia an opportunity to regain the Russian territories lost after Versailles Treaty: Estonia, Latvia, Lithuania, Poland, and Romania. 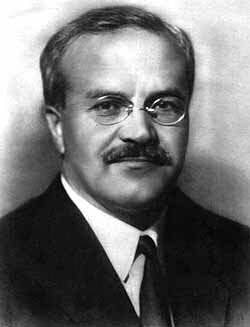 Ribbentrop, the former wine salesman, might not had been a well trained diplomat, but he was a great salesman; the Molotov bought up everything Ribbentrop was selling. On 24 Aug 1939, Molotov-Ribbentrop Pact was signed. 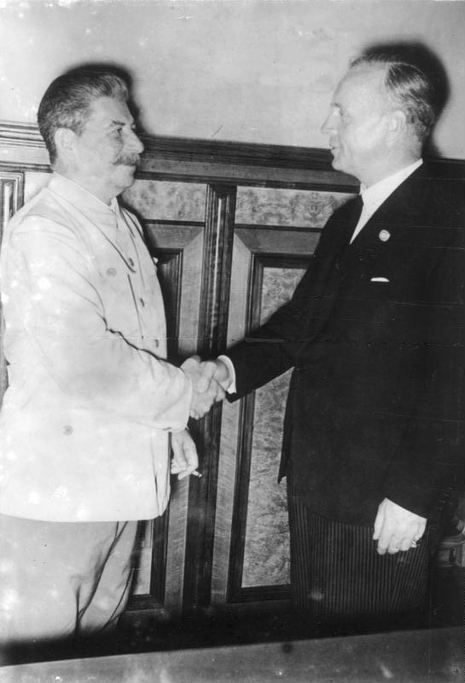 Molotov-Ribbentrop Pact. 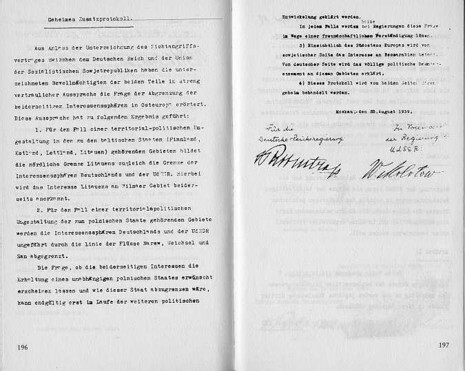 The popular name of the German-Soviet Nonaggression Pact signed in Moscow on 23 August 1939 by the foreign ministers of the Union of Soviet Socialist Republics (Viacheslav Molotov) and Nazi Germany (Joachim von Ribbentrop). The pact was signed immediately after the agreement of 19 August, which granted the USSR 180 million marks for the purchase of German goods. It followed months of unsuccessful negotiations between the USSR on the one side and France and Great Britain on the other, and Soviet failure to organize an anti-Nazi diplomatic coalition. On August 23, 1939, Hitler and Stalin signed a non-agression pact, called the Molotov-Ribbentrop Treaty. Secret protocols of the treaty defined the territorial spheres of influence Germany and Russia would have after a successful invasion of Poland. Hitler had been creating justifications and laying plans for such an invasion since April. According to the agreement, Russia would have control over Latvia, Estonia, and Finland, while Germany would gain control over Lithuania and Danzig. Poland would be partitioned into three major areas. The Warthland area, bordering Germany would be annexed outright to the German Reich, and all non-German inhabitants expelled to the east. More than 77,000 square miles of eastern Polish lands, with a population of over thirteen million would become Russian territory. The central area would become a German protectorate, named the General Gouvernement, governed by a German civil authority.